I indeed enjoy teaching, and I find it very satisfying to inspire students (especially those who are new to the subject) to explore the world of antiquity. In my eyes, it is especially important to teach things in class that are hard or impossible to learn by oneself. Cases in point are documentary sources (inscriptions, papyri, coins), paleography (both Latin and Greek), but also other things such as historical geography. This is one reason why many students cherish my classes as my teaching includes a lot of hands-on work involving (inter alia) atlases, ancient coins, images of inscriptions or manuscripts etc. From 2010 through 2015, I have been continuously teaching at the University of Augsburg. 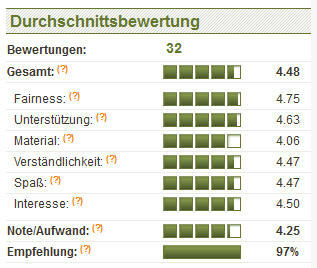 Meinprof.de is a German website which enables students to rate their academic teachers. As Augsburg University unfortunately does not carry out evaluations of all courses, I need to fall back on the meinprof.de data. Since these ratings are fully visible only to registered users, I will reproduce a summary of them here. You can see the values for fairness, support, teaching materials, understandability, fun factor, and interest. At the bottom, there is the recommendation value; with one exception, all students who ever rated my classes would recommend them to their peers.